The GeoTrax™ running track technologies feature IAAF approved surfaces. From world class stadiums to your own backyard, we provide people around the world with safe, reliable, and high-performing track surfacing products. GeoGreen™ Artificial Turf and Geotrax™ Running Surface at Pea Ridge High School Football Stadium in Pea Ridge, AR. The GeoTrax™ running track technologies feature a state-of-the-art filament running track and warning track surface. Our full build and design capabilities allow for superior functionality and increased usable space for any situation. Our filament design has the capability to completely eliminate dangerous transitions and hard asphalt or concrete surfaces in situations where surface certifications are not necessary. The GeoTrax™ filament design meets all criteria for an NCAA approved baseball or softball warning track and can take what was once a surface with little to no value and convert it to a usable surface for every sport. 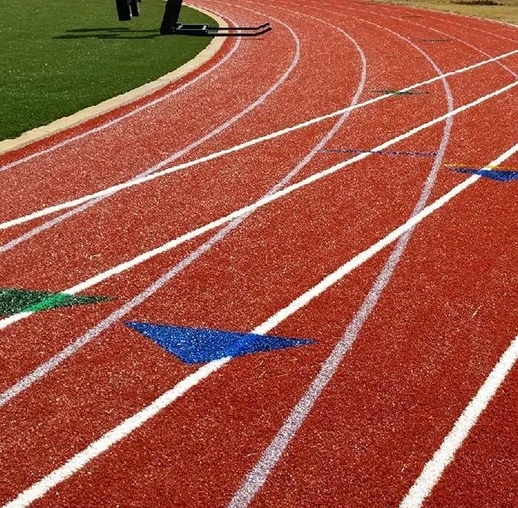 The GeoTrax™ filament running track is not designed to be a replacement for an IAAF surface but does offer great value for entry level track users and facilities that wish to maximize the functionality of the sports surfacing. No surface is ideal for all types of use. Sprinters perform better on a fast-response (harder) surface. Longer event runners maximize performance with a slower-response (softer) surface. Practice and training require a surface with higher shock attenuation to reduce wear and fatigue on athlete’s joints and muscles. The user should determine the best configuration for his intended primary use and be able to “tune” the track surface accordingly. The GeoTrax™ technology also allows the client to select school colors at no additional cost as well as install permanent lane lines and event markings. These advances eliminate costly re-striping and give the client a freshly painted look for years to come. The GeoTrax™ technology will cost considerably less that the norm for a conventional track surface. All conventional track surfaces require re-surfacing in 5 to 7 years. Re-surfacing (8-lane track) cost can range from $60,000 to $180,000. By comparison, the GeoTrax™ running track should not need maintenance for 5-6 years; and even partial replacement in high wear areas is much less costly. In addition, if permanent markings are selected, virtually zero maintenance cost should occur in the first 5 years. The GeoTrax™ running track includes a 5-year warranty. GeoTrax™ FT is the first synthetic filament running track surface engineered to allow “tuning” of the surface response-time in order to customize surface performance for its primary use. GeoTrax™ FP is a 15mm, impermeable, full-pour system featuring 3 specialized layers: a self-leveling fluid applied polyurethane coat, an innovative central force-reduction layer, and a fluid applied polyurethane topcoat with a dense matrix of broadcast EPDM rubber granules with no solvents or filler added. of polyurethane and embedded EPDM rubber granules. GeoTrax™ SP is a two layer, 13 mm, permeable spray coat track system. The base layer consists of black mat of SBR rubber granules bound in polyurethane. The surface layer is made up of polyurethane and colored EPDM granules applied by spray to provide a structural top-coat. GeoTrax™ SW is a 14 mm, sandwich style polyurethane track system. Its base layer consists of a black mat of SBR rubber granulesbond in polyurethane.